Take 1/4 cup of APF in a mixing bowl. Add in 1 tbsp of semolina, carom seeds and salt to taste. Pour 1 tsp hot oil in it and mix well. remove all the lumps. Now, start kneading the dough by adding little water at a time. Dough should be bit stiff. Cover with plastic wrap and let it rest for 20 minutes. 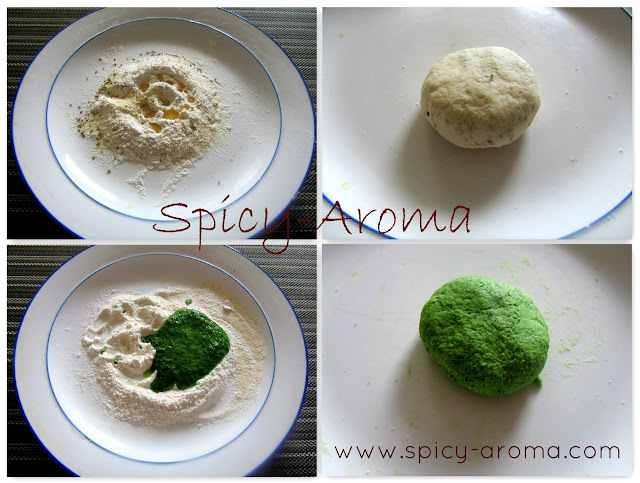 In a similar way, make the green dough with remaining 1/4 cup of APF, 1 tbsp semolina and spinach puree. If you want to make some colorful potlis, you may use beet puree to make red colored dough. Heat oil in a pan. Add cumin seeds, green chilies, pinch of asafoetida and curry leaves. Let them splutter. Add chopped onion and saute till translucent. Then add cumin powder, turmeric powder, dry mango powder and garam masala. Saute for few seconds. 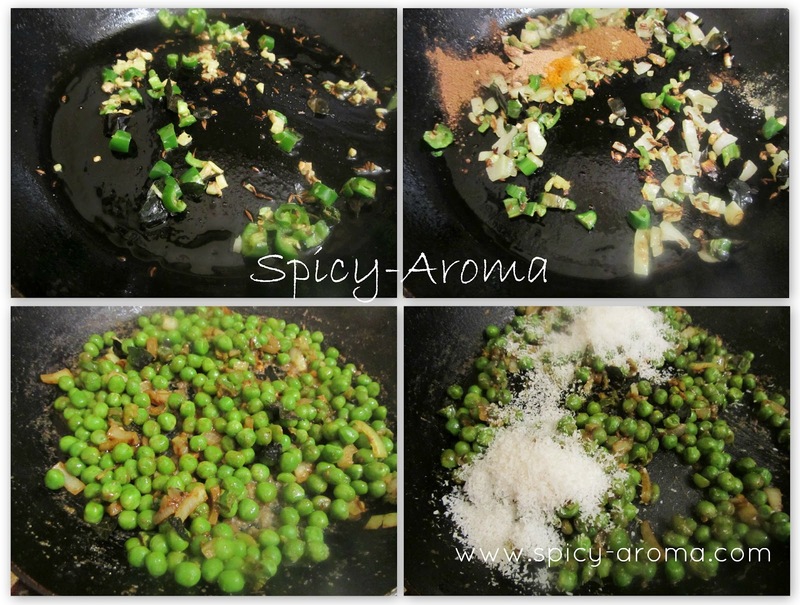 Add green peas and salt to taste. 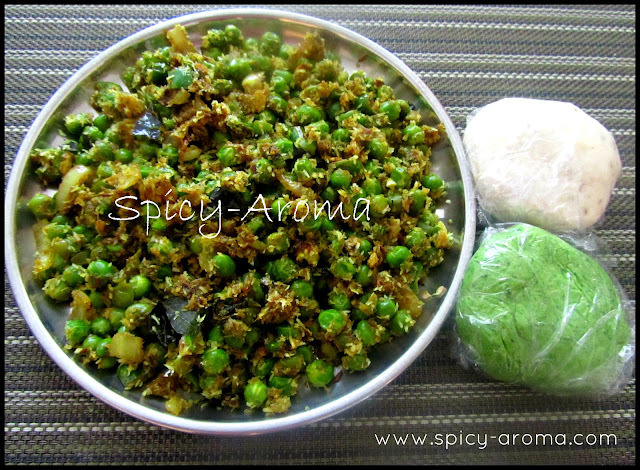 Cook till peas turn soft. Finally, add coconut and sugar. 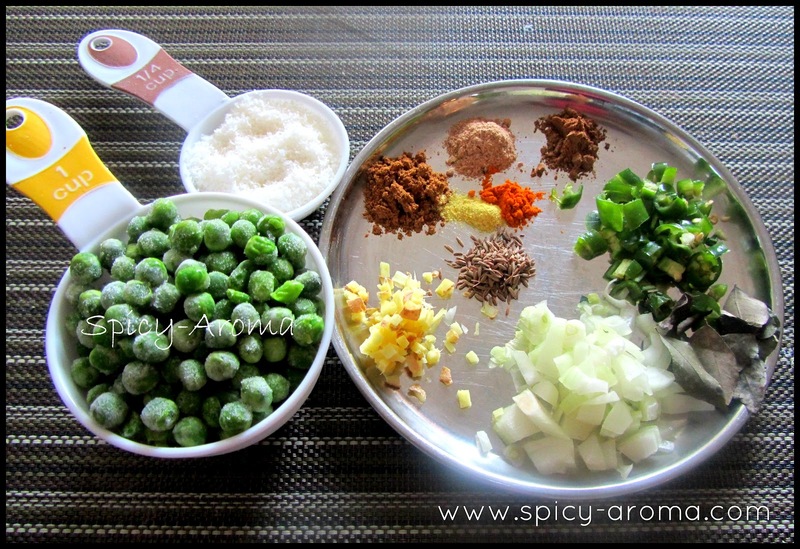 Mix well and cook for a minute. Switch off the heat and let the stuffing cool down. Sending this over to - Pari's "Only" Snacks and Starters event hosted by Raji of Vegetarian Tastebuds, Surabhi's Let's party event hosted by Divya of Divya's Culinary Journey, Sumee's Bon Vivant Moments #3 - Breakfast Ideas, Chandrani's SPOTLIGHT : "Healthy Breakfast Ideas"
Beautiful bundles. I love what you have posted. Its am awesome recipe. I will make this for sure. Bookmarking this now. Wow...beautiful...potlis are superb and delicious too..
Lovely beautiful potlis! 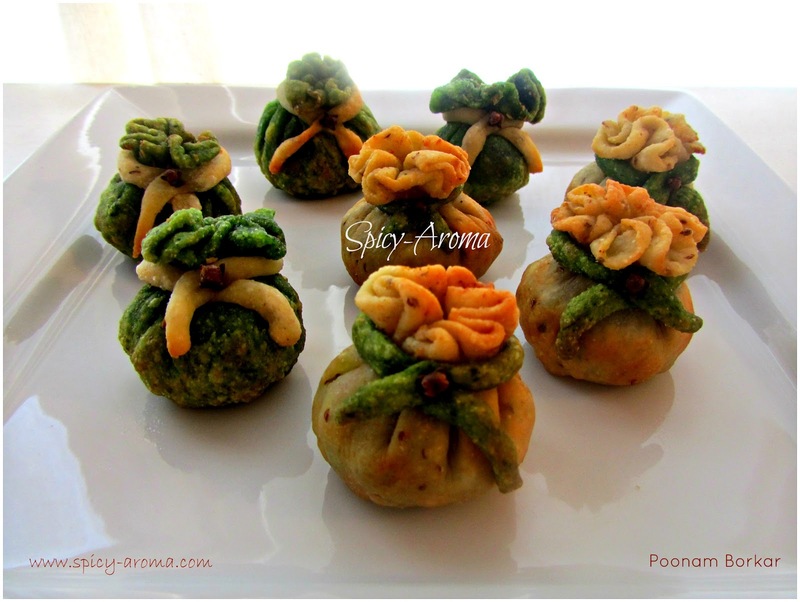 !Perfect tea time snack..
Super cute and attractive potlis,beautifully done.. So beautifully done, awesome work.. Very novel and delectable....lovely clicks too! Love this...would surely try it sometime..thanks a bunch for linking this to my event. Reminded me of my own corn potlis .. loved the colors! That looks so beautiful and delicious. Very creative!! Samosas are really cute and totally love it.Wonderful pics. Thats a very innovative recipe I have seen dear .. B'ful idea to bind the Potlis with the dough ring..
saw a potli samosa recipe in another food blog..looks quite this is quite popular..will try sometime...either your recipe or the other food blogger's recipe!! can they be baked, with out frying? Wow..they look cute...and your step by step pictures and details are really helpful...will try them..
Lovely pockets...The procedure with pictures are perfect. 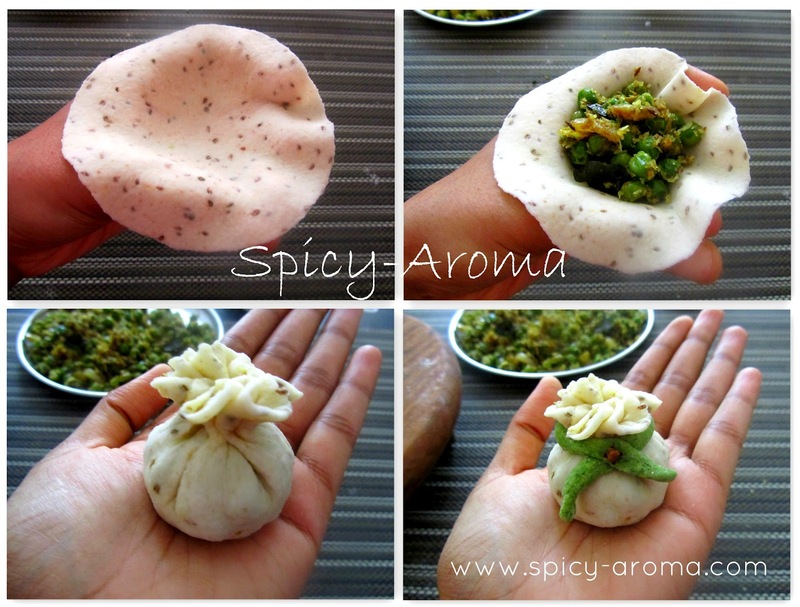 Samosa looks inviting..Will try this for sure. Potli looks wonderful. Stuffing also so good dear. Crunchy and perfect snacks. Thanks for linking my event. Hi Poonam I am new to your blog glad to follow you. 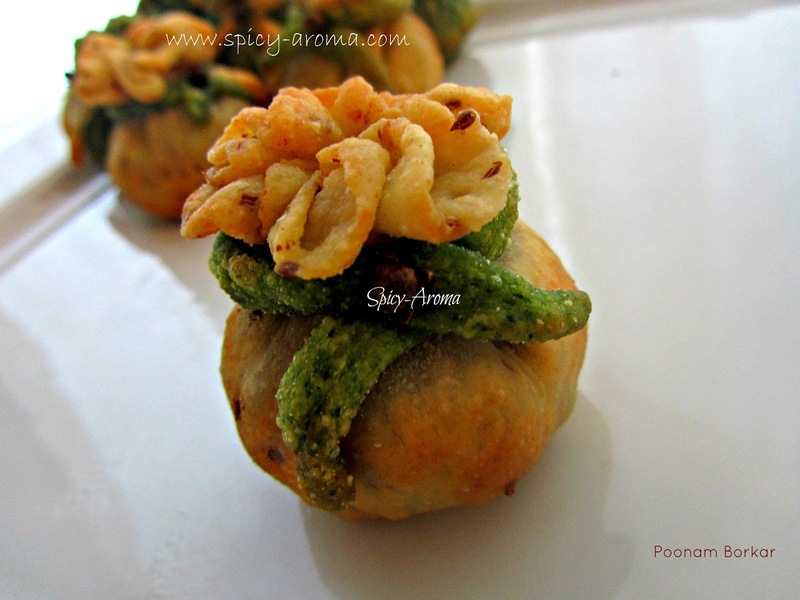 The samosa potlis are perfect khupch chan. 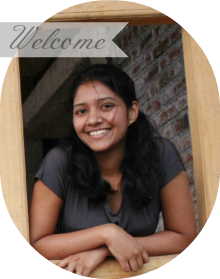 Do visit my blog in your spare time. Smart! and that is beautiful! Hi Arundhuti, I had stored regular samosas in refrigerator once in the afternoon and fried them later in evening. They were good. So give it a try, it should work.